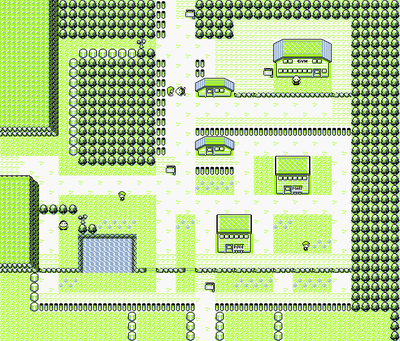 Viridian City isn't exactly a bustling metropolis, but it's bigger than Pallet Town. Here you'll find your first Pokémon Center, a place where you can go to restore your Pokémon to full health. You'll also see a Pokémon Mart, which stocks items useful to Pokémon trainers. This one has a delivery service and will need your help to make a special delivery. Visit the Pokémon Center to fully restore your Pokémon's Health Points and the PP of their moves and cure them of any ailments, including Poison, Sleep, Paralysis and more. Best of all, these services are free of charge! Upon arriving at Viridian City, there are a couple of new buildings for you to explore. The very first building that you will come across is the Pokémon Center. It is in these centers that a nurse will heal all of your Pokémon for free. You may also use their PCs to access your item storage, change your Pokémon roster, release Pokémon, check your Hall of Fame records, and have Professor Oak evaluate your Pokédex without having to directly speak to him. This is likely the first place you want to go to when you enter a new town or city. You don't want to be unprepared for any sudden battle challenges. You can't go any further north for the moment, because a man who fell down is blocking your way and won't move. Above and to the right of the Pokémon Center is a Poké Mart, where it sells you goods for your journey, such as Potions, Medicine, Poké Balls, and other useful items. During your very first visit, the manager inside won't sell you anything. He does, however, run a delivery service, and will ask for your assistance in delivering a package to Professor Oak. It must be important, so help him out. Return to Pallet Town via Route #1. You can use the cliffs as a shortcut back so you don't have to encounter wild Pokémon again although the extra experience can be still worth it. When at Pallet again, go to the Pokémon Research Lab. When you deliver the package to the Professor, he will give you and your rival a Pokédex, a sort of digital encyclopedia with entries for every Pokémon... as soon as you fill them in by catching them. Before you leave town again, enter your rival's house in the northeast. Speak to his sister, who is far kinder to you than your rival ever was, and she will provide you with a Town Map, which shows your current location in the Pokémon world as well as the location of the other routes and cities. When used in conjunction with the Pokédex, you have one powerful Pokémon hunting tool. This is optional but very useful for players that are new to Kanto. Once you've completed your errand, return to Viridian City. With that done the Poké Mart is back in business. The clerk will sell you whatever you need now as long as you have the money, and you'd be wise to stock up: since you lose half of your money when you run out of usable Pokémon (because they've all fainted), it doesn't pay to keep a lot of cash on hand. Don't buy Parlyz Heals nor Burn Heals now: they are useless at the moment; The chances that a Pokémon's attack can burn your Pokémon are very rare in-game, and Paralysis is not likely to occur until somewhere around the third gym. On the other hand, Antidotes may be useful, as Weedle can poison you. You may wish to buy as many Poké Balls as you can afford (you'll be needing them), some Potions if you're running low (they're only for sale here in the Yellow version) and maybe an Antidote or two to play it safe, since there are plenty of enemies that can poison your Pokémon in the Viridian Forest. If you're low on Potions, don't worry, as there are a lot of them lying around early in the game. The building immediately to the north of the Pokémon Center is the Pokémon School. You can learn some things about status conditions by reading off of the blackboard. There is also a Potion hidden behind the weird Y-shaped tree in the northwest corner of town. If you head north, you'll find that the old man who was blocking your path has finally gotten himself together and out of your way. If you talk to him, he'll apologize to you and will then proceed to give you a lesson on the proper use of Poké Balls. When he's finished, you can head past him to Viridian Forest, the area you'll have to cross to get to your next destination. Note: in Pokémon Yellow you are forced to talk to the old man and have him teach you. When he is finished, he will walk away and you will never see him again in the game. The old man is important for a glitch later on. Thus, the glitch is not possible in Pokémon Yellow. Even if the old man was still there, they did further fixes just in case. Log on to the PC in any Pokémon Center to access three different computer systems: yours, Professor Oak's, and a third system operated by a mysterious "Someone." There's a limit to the number of items and Pokémon you can carry at one time, and any extras can be stored in these systems. Captured Pokémon go straight into your party if you have space. If not, you'll find them stored in Someone's PC. When you access Professor Oak's PC, you can ask him to evaluate your progress. Only half of Metapod's HP is left. You may want to go straight to Viridian Forest, but don't be too hasty! Route #1 was full of Pokémon that you can catch anywhere, but the area west of here, Route 22, has a few interesting finds, especially in Yellow version. But don't go past the grassy area, or your rival might challenge you to a fight when you're not quite ready. You'll want to have a bunch of good Pokémon before you attempt to challenge the Viridian Forest. Spend the next few minutes tracking some down on Route 22. NOTE that if you can beat your opponent's Pokémon without first purchasing any Poké Balls or catching any of your own first (which is easy enough if you picked Squirtle, as Bulbasaur only learns Leech Seed, which does not trip your Squirtle's type disadvantage) Prof. Oak will give you 5 free Poké Balls, a great value for a cash-strapped new trainer. Whether you're trying to catch all of the Pokémon you see or just the ones that you need, you should always be prepared for an encounter with a rare Pokémon. This means having at least 3 or 4 Poké Balls on you at all times, and at least one low-level Pokémon on your team. That last part is important, since it's incredibly difficult to catch Pokémon when they're at full health. They're a lot easier to catch when they're in the yellow damage zone, and a cinch when they're in the red, but you'll need a weak fighter to take them down to that level or you may accidentally defeat your target as you whittle away at its health. Sleep, Paralysis, and other negative conditions also make catching wild Pokémon easier, but don't use Poison or Burn or they could be defeated. Once you've caught them, Pokémon need lots of experience to level up. Weak Pokémon who can't survive battles have a difficult time earning experience. As a result, they can be hard to level up unless you use this simple trick: put your weakest Pokémon at the front of your roster. When the battle starts, your weak Pokémon will appear to face the challenger. As your very first move, swap him out for one of your tougher Pokémon who can beat the challenger. The stronger Pokémon will do all the work, but since every Pokémon who appeared in the fight gets to share the experience, the weakling will still get half! But beware: since you're using your first turn to switch Pokémon, your opponent will get the first attack. This page was last edited on 27 July 2016, at 13:04. This page has been accessed 600,595 times.